With the Harken Hoister 145lb 4 Point Kayak Lift storing your kayak has never been easier. Clip and lift, it's that easy. The fastex buckles make cradling the Harken Hoister under your kayak a snap. 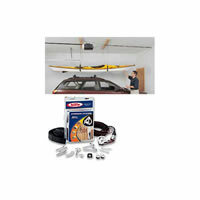 The block and tackle (with safety cleat) allow even the smallest paddler to easily raise their boat to the ceiling and lower back down to the car or floor. And the safety cleat cams down on the hoisting rope so no matter where you stop pulling or lowering the boat stops dead! All the components are high end sailing hardware so you know they're built to last. So whether your looking to store your kayak in your garage, barn or under the second story deck, the Harken Hoister 145lb 4 Point Kayak Lift will make the job of lifting and storing as simple and easy as possible. This Harken Hoister 7803 Kayak Storage and Hoist is rated for 145lbs and can raise a kayak 12 feet vertically. From epron of ares, France on 1/9/2014 .